This was originally published on November 29, 2016 on the Abolitionist Approach Facebook page. This is our first Webinar, which occurred on November 27, 2016. The organizer was Benjamin MacEllen. There were more than 500+ participants. This was originally published on November 26, 2016 on the Abolitionist Approach Facebook page. This was originally published on November 25, 2016 on the Abolitionist Approach Facebook page. 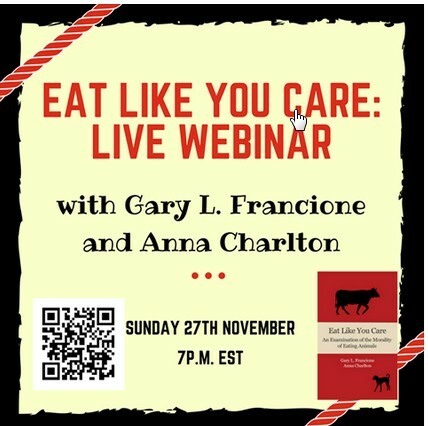 We’re excited to invite you to our very first live webinar where Anna Charlton and I will be discussing our book Eat Like You Care. If you think animals matter morally, whether you’re vegan or nonvegan, you won’t want to miss this. It’s free and open to everyone. Hear the answers to some of the most common questions about veganism and acquire some helpful advocacy suggestions. You’ll even have the opportunity to ask us questions! The webinar will be held on Sunday 27th November at 7 p.m. Eastern Standard Time, and you can join on any device with internet connectivity: smartphone, tablet, laptop, desktop, etc. Tell your friends: vegan and nonvegan alike! We look forward to seeing you all next week. Here’s the link to our event page.